What Does it Mean to Be an Irish Language Enthusiast? People have their reasons for learning a new language. Some will learn it because they want to get a better job or they are planning to move to a new country. When looking back at our experience and amazing feedback from the community, we can say for sure that the reason why someone will learn a language can tell you how passionate they are. When Irish language enthusiasts start learning Irish Gaelic, they don’t do it because they have to – they do it because they’re passionate about it. Most people who learn the Irish language will do it to better identify with their Irish heritage. It’s not like someone would learn English because they need it at work. People who learn Irish are passionate about it (and about everything related, including culture, history, music, etc.) – and that’s one of the reasons why we launched the new Enthusiast subscription plan. Do you feel the same about learning Irish? You must be an Irish language enthusiast. In this case, signing-up for the new Enthusiast Plan should be the next step in your Irish learning journey. We’ll always develop our tools so you can learn Irish Gaelic at your own pace so beginners are always welcome to sign-up. If you feel you want more from your Irish learning experience and want to take your Irish skills to the next level, then the Enthusiast plan is great for you. Want to know more about the new Enthusiast plan? Do you feel like it’s the natural next step in connecting to your Irish heritage, but you’re still undecided? That’s perfectly fine. 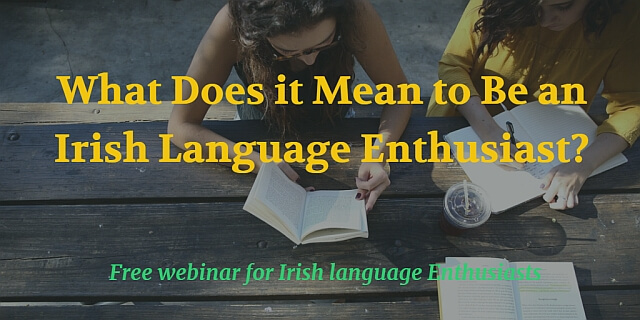 We invite you to join our free webinar for Irish language enthusiasts. Eoin (founder of Bitesize Irish Gaelic) will run a free webinar about the new Enthusiast plan on Saturday, March 24th at 18:00 GMT (14:00 EDT). You’ll be able to see the features in action, and ask questions that might be holding you back.